SubliJet-HD is a high-viscosity sublimation ink for the Sawgrass® Virtuoso™ SG400 and SG800 printers. 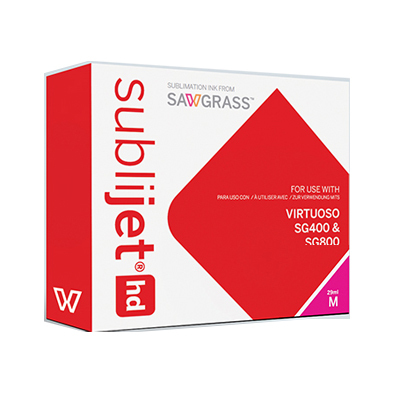 Uniquely formulated for Sawgrass' Virtuoso HD Product Decorating System, these inks feature expanded gamut and extended yield for vibrant, true-to-life colors and lower imaging costs. Cyan, Magenta and Yellow cartridges - 29ml. NOTE: Once sublimation ink cartridges have been removed from their packaging, they are non-returnable. Please verify that you have purchased and received the correct cartridges for your printer before opening.